A few weeks ago I had the opportunity to interview Cupid about his experiences with the Alexander Technique. Me: Cupid, thank you so much for taking the time to speak to me. I know you’re busy at this time of year, gearing up for the special demands on you for Valentine’s Day. Cupid: No problem, Robert – I’ve had such positive experiences with the Technique that I love sharing them with everyone I meet. Me: What prompted you to take Alexander lessons? 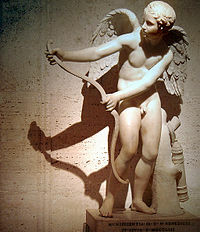 Cupid: Well, for years I’ve noticed that my speed and agility were not what they should be. Those are both critical for my job – I am always having to sneak up on people very quickly to shoot an arrow into their heart – and the problem was getting worse. One day I started thinking about my early life and realized there was something I had long forgotten: I was born from a silver egg! That’s what got me interested in the Alexander Technique. Cupid: Yes, the silver egg. You see I started thinking about being confined in that egg, and how it might have led me to compress my body. And that I might still be doing that a little bit unconsciously. Well, one bit of research led to another and I learned that the Alexander Technique is one of the best ways around to learn to let go of harmful, habitual, unconscious, habit patterns. Like self-compressing. Me: Did you find that lessons successfully helped you with your self-compression pattern? Cupid: Absolutely, right from the first lesson. I know that sometimes it take a few lessons to start really “getting” the Alexander Technique, but in my case there was so much overall release, so quickly, that I was hooked. I had my first lesson about half a year ago and now I can do a good deal of self-decompressing on my own. That’s the wonderful thing about the Alexander Technique: there are specific ways of thinking, and simple procedures, you can do yourself. You don’t need to keep going to a teacher. At the moment, I still find a lesson every few months can be useful, but I don’t imagine that will last much longer. Me: That’s an amazing story Cupid! I wonder if the Technique has helped you in other ways? Cupid: Well, I have to do a lot of arrow shooting. And it has to be done quickly and accurately. While my aim was still pretty good before taking lessons, I was getting a lot of pain in my wrists and arms and sometimes even in my shoulders. I realize now that these were signs of Repetitive Strain Injury. The Technique helped me to hold my bow up and pull my arm back more easily, with less extra strain. Over time, the pain has pretty much all gone away. Me: Are there other ways the Alexander Technique has helped you? Cupid: Yes, but they’re more subtle and harder to describe. Of course you know I’m blind and I have to hit a victim’s heart to get them to fall in love. So I am heavily reliant on my other senses and I do feel they have improved with Alexander lessons, but in ways I cannot really understand at this point. I also feel I have more energy, but it’s not easy for me to describe or quantify. Me: Cupid, thank you so much for this interview – I’ll make a point of posting it on Valentine’s Day. Cupid: That would be lovely Robert! I’ve tried to get this interview for years, but Cupid always shot me down. Nice Mark! Maybe that was a good thing (for you)?? You manage to get interviews with all the classic characters! I try – got some more coming up! Nice one Robert! Did you manage to get Santa – I hear he’s had come back problems with that heavy sack over the years…. Have it covered Penny: https://www.bodylearningblog.com/category/santa-claus/ You must have living it up in Greece when it was published.